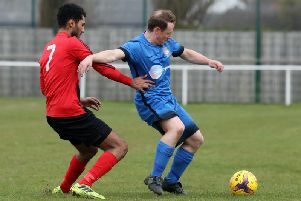 Will Arnold grabbed a dramatic late winner as Desborough Town’s fine start to the ChromaSport & Trophies United Counties League Premier Division season continued. Ar Tarn looked like they would have to settle for a share of the spoils at struggling Boston Town after Jason Turner’s first-half penalty was cancelled out by the hosts just before the hour. But Arnold was on hand to wrap up a fifth win in seven league matches so far when he struck in the third minute of stoppage-time. Two goals in as many minutes from Jordan Henson sealed a point for Rothwell Corinthians as they battled back from 2-0 down to draw 2-2 with Sleaford Town at Sergeants Lawn. Corinthians looked to be heading for a fourth defeat of the season when they trailed 2-0 at the break. But Henson struck on 66 and 68 minutes to bring the hosts level but they were unable to go on and find a winner, despite Sleaford being reduced to 10 men. Whitworth were the big winners in Division One as they hammered Stewarts & Lloyds 7-1 at London Road. Jack Dyson was the hero for the Flourmen as he struck four of his team’s goals while Dean Hall and Theo Alcindor added the others. Ryan Hall grabbed the consolation for the struggling Foundrymen. Raunds Town’s good run of form was ended by a 1-0 defeat at Bourne Town and Thrapston Town suffered their third loss of the campaign as they went down 2-0 at Daventry Town. Burton Park Wanderers stopped the rot as they claimed their second point of the season with a 1-1 draw against Woodford United at Latimer Park. Despite what Jeff Stelling was told, Irchester United claimed a 1-1 draw against Blackstones at Alfred Street. The popular television presenter revealed on his Soccer Saturday programme on Sky Sports that the Romans had been beaten 15-1 in their clash. However, that wasn’t the case. Instead they earned their seventh point of the season with a share of the spoils. Elsewhere, Rushden & Higham United suffered a 5-2 defeat to Long Buckby at Hayden Road.